Millennials demand a lot from work: a challenging job that pays well, co-workers they like and trust, a Boss who is more like coach, and opportunities for development and recognition for a job well done. Who doesn’t want the same things? Employers who understand the unique competencies and perspectives that Millennials bring to the workforce will excel at attracting, retaining and developing top talent. Thinking differently about workplace flexibility – Millennials don’t separate life and work. Proving adequate support and feedback so Millennials can learn and grow. Build coaching managers because Millennials thrive in a coaching culture. Learn how to uncover and appreciate where each generation is coming from and apply techniques that can close the generational and cultural divide. Linda St. John is Founder and Principal of LSJ Leadership Coaching, a Worcester, MA firm that specializes in employee retention. Linda’s work focuses on developing and implementing talent management initiatives, such as onboarding, mentoring, and coaching all with a focus on helping client companies hire and keep the right people. In 25+ years in Human Resources, Linda moved steadily through the ranks, holding more than 10 leadership positions across a range of functions at healthcare organizations, ultimately becoming Chief Human Resources Officer at Fallon Health. In 2013, and during her tenure, Fallon was named as a top workplace in the “Education, Training and Career Development” category by the Worcester Business Journal. Linda has a Masters in Organization Psychology and a graduate certificate in executive coaching from William James College in Newton, Mass. In addition, she holds an MBA in Healthcare Administration from Anna Maria College in Paxton, Massachusetts and a BA in Public Relations and Journalism from Utica College in New York. She is certified in Myers-Briggs Type Indicator (MBTI), The Emotional Intelligence Tool EQi-2.0, and the Center for Creative Leadership (CCL) 360-degree suite of assessments. 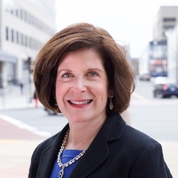 She chairs the Worcester Advisory Board of Bottom Line – an organization that helps low income, first generation students get into college, graduate and go far in life – and is a member of the organization’s Massachusetts Board.